Double Helix Wine & Whiskey Lounge opened at Town Square in 2011 and has served as an unrivaled destination for great food, unique drinks and a dynamic social scene for more than seven years. The 2,800 square-foot-space features as a full bar serving 60 wines by the glass, 250 whiskey labels, custom cocktails, wine and whiskey flights, as well as an assortment of small plates created by Executive Chef Doug Vega. Double Helix offers happy hour from 3:30 to 7:30 p.m. nightly and an award-winning brunch, featuring bottomless mimosas, from 11 a.m. to 3 p.m. Saturdays and Sundays. The venue is also available for private events ranging from bachelorette champagne parties to corporate mixers, featuring educational wine and whiskey tastings. For further information, please visit www.doublehelixwine.com, call 702-473-5415, or follow us on Twitter (@doublehelixwine), Instagram (@doublehelixlasvegas) and Facebook (www.facebook.com/doublehelixwinelounge). For exclusive offers and updates, download the mobile app by texting 43549 to 99629. For private events, call Michael at 702-561-7227. Every day between 3:30 and 7:30 p.m. Double Helix offers happy hour from 3:30 to 7:30 p.m., seven days a week. It features half priced select wines by the glass and small plates, including Double Helix's famous Arancini - risotto fritters with mascarpone, roasted mushrooms and truffle aoili. 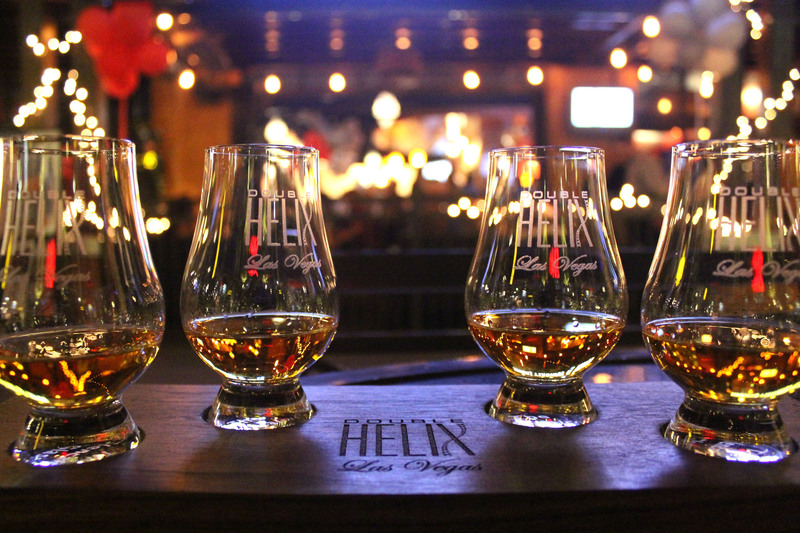 Enjoy half-off Double Helix's Whiskey of the Month all day every Wednesday!